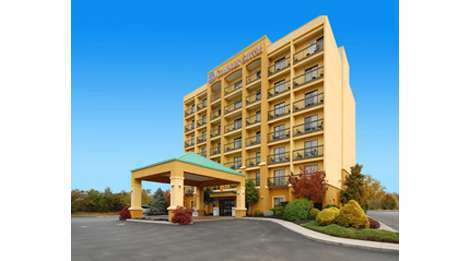 Comfort Suites is located one block off the main Parkway (directly behind Tennessee Shindig), and provides convenient, clean lodging, while you experience all of the fun and excitement in Pigeon Forge!!! Comfort Suites offers 76 Brand New Suites located on the highest point in Pigeon Forge with a spectacular view from every balcony. All rooms are interior Corridor and Non-Smoking, all Suites are complete with Mini-refrigerator, microwave, coffee/tea maker, hair dryer, iron and ironing board. for those that need to mix a little business with pleasure, you will find a spacious work desk in your room with access to FREE High Speed Wireless Internet and FREE Local Calls. Each morning of your stay receive a FREE USA Today Newspaper and enjoy our FREE “Hot and Savory” Breakfast. Take a dip in our full size indoor heated pool/whirlpool or outdoor (seasonal) swimming pool or just relax on a lounger working up a tan. Have some fun in our electronic Game Room or get a workout in our Health & Fitness Center.